A part of Harper Perennial’s special “Resistance Library” highlighting classic works that illuminate the “Age of Trump”: A boldly packaged reissue of the classic examination of dangerous nationalist political movements. A stevedore on the San Francisco docks in the 1940s, Eric Hoffer wrote philosophical treatises in his spare time while living in the railroad yards. The True Believer—the first and most famous of his books—was made into a bestseller when President Eisenhower cited it during one of the earliest television press conferences. 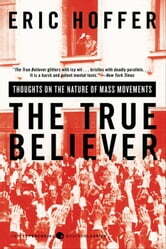 Called a “brilliant and original inquiry” and “a genuine contribution to our social thought” by Arthur Schlesinger, Jr., this landmark in the field of social psychology is completely relevant and essential for understanding the world today as it delivers a visionary, highly provocative look into the mind of the fanatic and a penetrating study of how an individual becomes one.